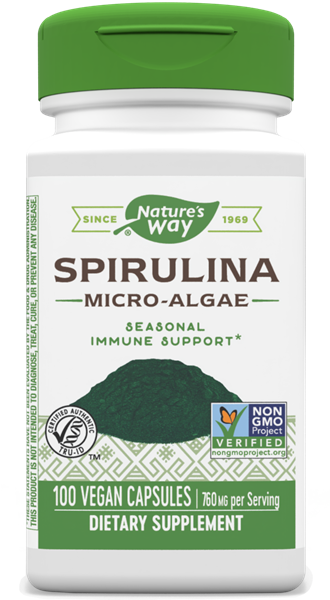 Spirulina / 100 Caps - Nature's Way®. Contains 65% protein in its dried state. Spirulina is a type of blue-green micro-algae that forms spiral filaments or chains that led to its descriptive name. Spirulina is an aquatic plant which contains 65% protein in its dried state. Take 2 capsules three to four times daily, preferably with food. If pregnant, nursing or taking any medications, consult a healthcare professional before use. Contains the amino acid phenylalanine. Do not exceed recommended use.